If amateur content can be shared freely, where does that leave Blair Witch Project? Japanese researchers have come up with a rather snooty technique for detecting online pirated video content in places where it shouldn't be. 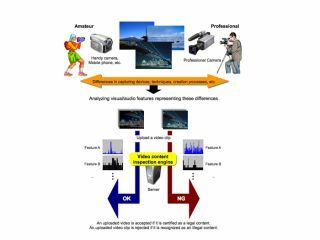 By analysing clips for 'amateur-looking techniques' KDDI reckons it can sort the professional stuff out from the dross the rest of us produce. In theory, the ' video content inspection engine' [PDF link] sits on the servers of a video-sharing website and analyses any video uploaded to it for the telltale signs that it is actually a professional production. The software looks at the kind of camera, filming techniques and the audio quality to categorise each clip. KDDI reckons this approach is more efficient than the 'fingerprint' technique being tested by some video-sharing sites, as it doesn't require content to be uploaded in advance by the owner if it is to be marked as copyright. Instead it works on the fly, accepting or rejecting videos as they are submitted. The company claims its approach is 98 per cent successful in separating the wheat from the chaff of the video world. On the other hand, it's also 100 per cent successful in perpetuating the patronising mentality of many media companies that neither know what a talented amateur can do these days nor understand the fan-sustaining qualities of sites like YouTube and its ilk.